I am craving spring. I thought I might hasten its arrival (at least in my mind) with some daisies from the grocery store. 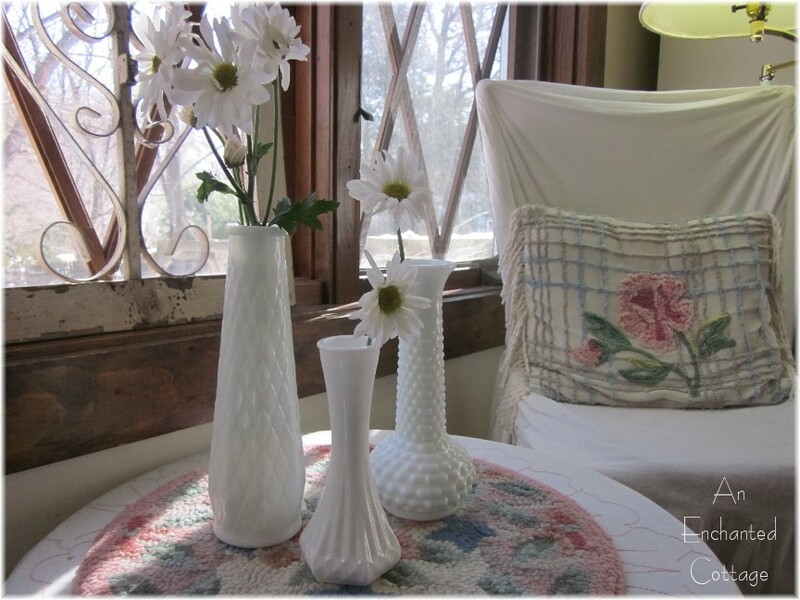 Is anything more charming than cut flowers in vintage milk glass vases? With any luck, I hoped they would last at least a week. Little Miss Curious doesn't miss a trick, or anything new brought into the house. ...Please Don't Eat The Daisies! 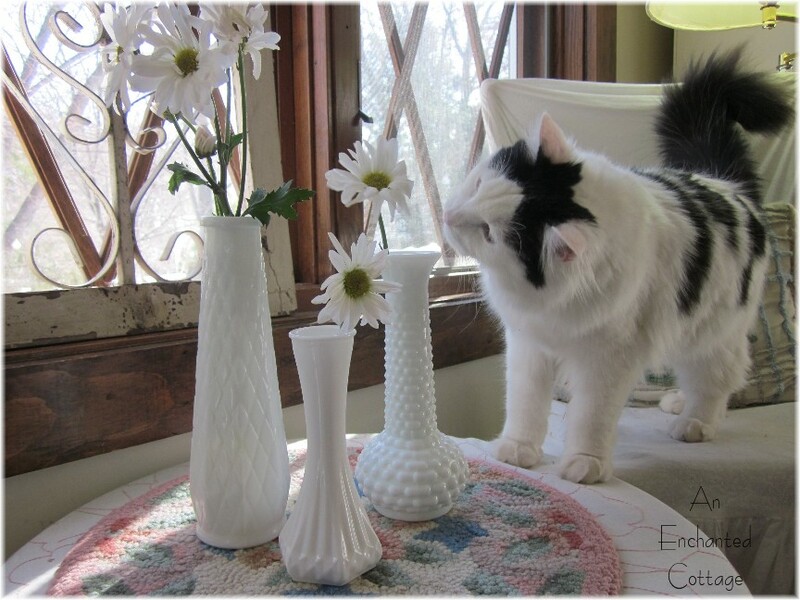 I actually removed the daisies right after taking these photos because I couldn't remember if they were poisonous to cats or not. So I checked this ASPCA Toxic/Non-Toxic plant list and was horrified to find that daisies are toxic to cats. Needless to say, the daisies are gone. We are going to hit the 50's and 60's this weekend in New England. Finally. I hope you all enjoy glorious weekends! I'm linking up to Cindy's (My Romantic Home) Show & Tell Friday. Be sure to pop on over to see Cindy's beautiful table settings and to visit everyone else participating in Show & Tell this week! Girl....if it's still looking like your header at your house (snow and all)....I certainly understand your need for Spring. As usul, the cat looks pretty in the pictures. I didn't now that daisie are poisonous. Thanks for passing that on. Leave it to cats. They have to add their scent to everything new that comes into the home. Same goes on here. The Easter Lily is another plant that is on the 'list of poisonous plants for cats'. They are extremely poisonous. Too bad because they are gorgeous and would look nice sitting next to a cat. Buyer beware!! Your cat sure has character. Photos made me smile. Thanks for sharing! Well, it makes a pretty picture...glad it won't hurt the cat!! Re your comment on my blog - you have to have a willing participant (toe hair trimming). Rosko is very good to let me do it, but Oskar would never even let me touch him, let alone take the scissors to his feet. May he rest in peace. I still miss him but I am so thankful for what I have left (Rosko) who is VERY loving and laid back. Oskar had kitten rage when we got him and never really socialized well. We were able to handle it until he got sick and we were unable (or even the vet, for that matter) to treat him. But we loved him dearly. PS...reading your side bar and saw that you've just gone through a 44 lb weight loss....that's awesome!!! I need to and have to start somewhere...hopefully you are my impetus!!! Hi Donna! We're ALL so ready for spring, aren't we??? Lucky you that you're getting those warmer temps this weekend! Yay! Oh, our cats...our cats....! Where would we be without them? lol! Toby, our marmalade, loves to eat the bird's nest I have on the end table for some crazy reason. He's definitely the first one putting his little pink nose into any plant that I bring home! lol! I really had to laugh out loud at your pictures....kitty's can be so darn....hmmmmm...whats the word I want PIT..(pain in the tush's) The pictures are adorable and so is your furr baby! Oh I am sooooo ready for spring! 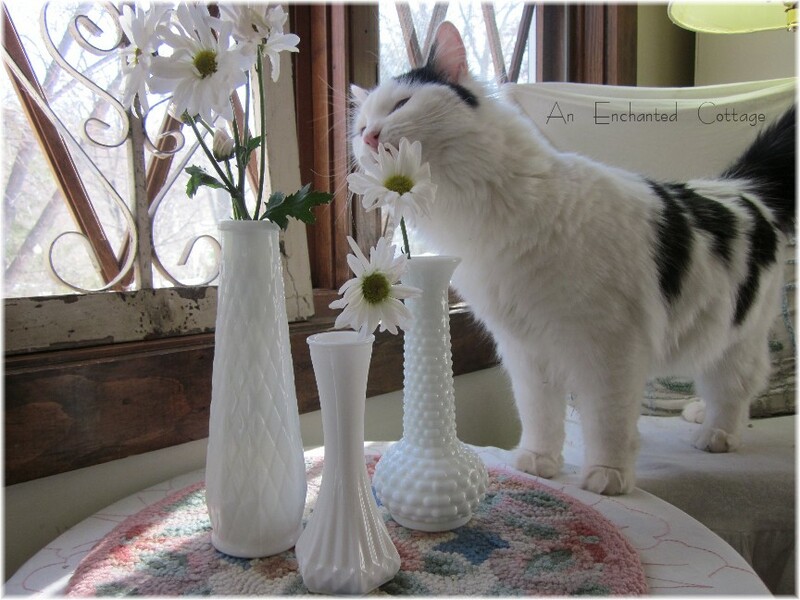 Your daisies are darling and so is your sweet kitty! 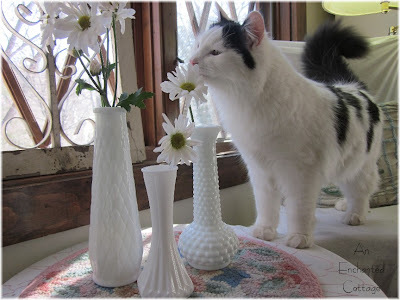 I just love milk glass! My mother has some that belonged to my grandmother. It's so pretty. Oh my, those were so pretty too! I guess you're going to have to get some artificial flowers for the vases, LOL. We've got a warm spell going on here too. I wore short sleeves today! I just love your cat...these photos are so sweet! I knew easter lillies were deadly but not daisys! My old cat used to eat the baby's breath that came with arrangements. I always had to throw that out! My cats are just as curious. I can't have flowers in the house unless they are on a really high shelf on a bookcase. Your kitty is so so so precious. Our Rocky does the same thing...jumps up smells the flowers and then starts eating. I do miss having fresh flowers in the house but have just learned to enjoy them growing out in the yard. You are a good kitty mama. 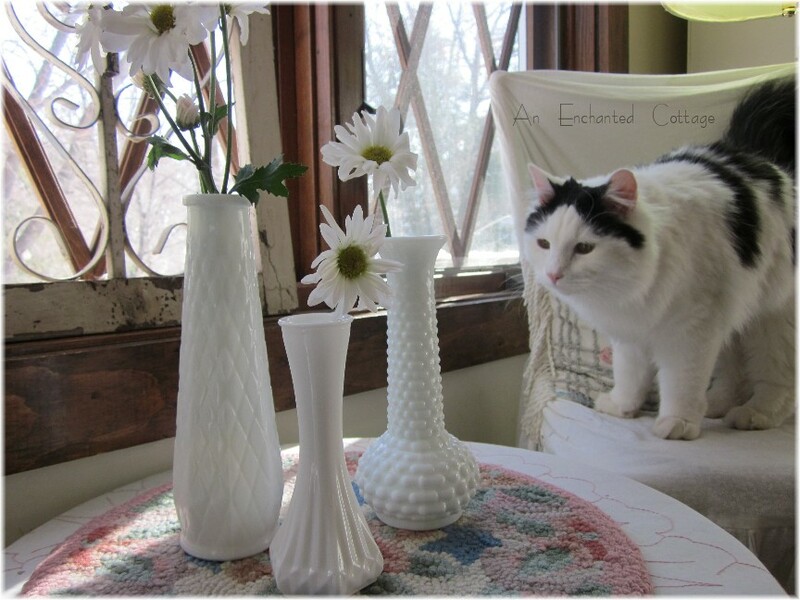 I love the milk glass vases!